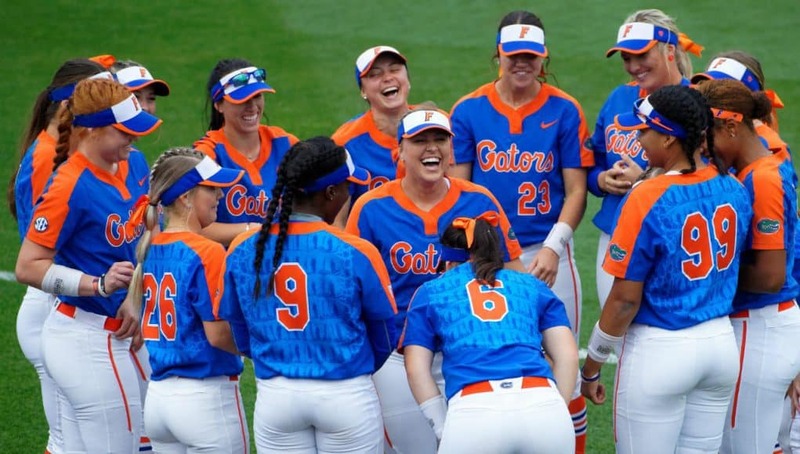 GAINESVILLE, Fla. – Down to the final strike of the game, with runners on first and second, freshman Jordan Matthews came up with the biggest hit of her Gator career – a three-run homerun to send the Gators to OKC. 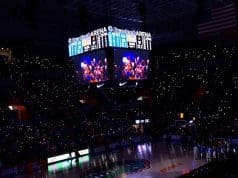 The second-seeded Florida Gators once again used late-game heroics to top No. 15 Texas A&M, 5-3, in the deciding Game 3. UF advances to its ninth WCWS in program history, and have now advanced six of the last seven years. Florida held the 2-1 lead going into the top of the seventh inning thanks to RBIs by Hannah Adams and Janell Wheaton, but Tori Vidales smoked a two-run homerun in the top of the frame to take a 3-2 lead over the Gators. The Gators fought to their final strike in the bottom the seventh inning and it paid off. After Texas A&M issued walks to both Amanda Lorenz and Kayli Kvistad, Jordan Matthews stepped up to the plate with two outs. She fell behind 0-2, but blasted a homerun to left-centerfield for the walk-off win. That was Florida’s 11th come-from-behind victory and fourth true walk-off of the season. Bottom 4th 1-0 With two outs in the bottom of the fourth inning, Hannah Adams singled to left field to score Jordan Matthews from third and give Florida the 1-0 lead. Bottom 5th 2-0 Janell Wheaton singled over the third baseman’s head to score Lorenz from third and put the Gators up 2-0 over Texas A&M. Top 6th 2-1 With the bases loaded, Aleshia Ocasio struck out Riley Sartain, but the final strike of the at bat got past Wheaton. Tori Vidales scored on the wild pitch to bring the Aggies to within one. Top 7th 2-3 Tori Vidales homered to dead centerfield, scoring Sarah Hudek to give Texas A&M a 3-2 lead in the top of the seventh. Bottom 7th 5-3 Texas A&M walked both Amanda Lorenz and Kayli Kvistad in the bottom of the seventh. Down to her final strike, Jordan Matthews blasts a homerun to left center, putting the Gators up 5-3 and sending Florida to the WCWS for the ninth time in program history. 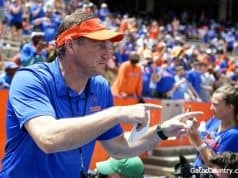 The Gators are headed to their ninth Women’s College World Series in the past 12 seasons (2008, 2009, 2010, 2011, 2013, 2014, 2015, 2017, 2018). The win was Florida’s 11th come from behind victory of the season and second of the series. This was just the fourth Game 3 that the Gators have played in at the Super Regional level. UF moves to 3-1 in deciding Game 3s. Florida improved to 19-7 in Super Regional action and now holds an 18-5 all-time record against Texas A&M. 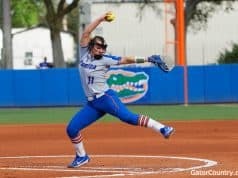 The Gators have now advanced out of the Super Regional round nine out of its 11 appearances to the Women’s College World Series. o All nine WCWS appearances have come under the guidance of head coach Tim Walton. o The program improved to 19-7 in Super Regional play and 3-1 when the series is forced to a game three. The team drew five walks in this afternoon’s game and lead the nation with 348 on the season. o The NCAA record for walks in a season is 349, which Auburn set in 2016 over 70 games played. This year, the pitching staff has amassed 547 strikeouts. It’s only the fourth time in program history that the Gators have had more than 500 strikeouts in a season. Florida heads to the Women’s College World Series, beginning on May 31. Game times will be determined once matchups are set at the conclusion of the Super Regionals.